We first got a glimpse and preview of floating 3D user account picture which can swing or rotate sideway in Windows “Longhorn” Server build 4xxx (now officially named Windows Server 2008). 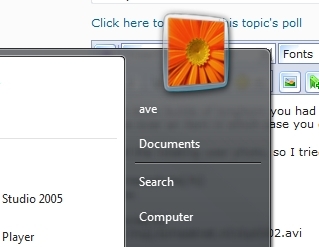 The feature allows the static user photo on top of the Start Menu to become a 3D rotating image as demonstrated in the in Windows Server 2008 build 4xxx instead of simple fading effect when you mouse over a menu item. Why on earth it’s introduced in Windows Server 2008 which is meant as a server product but not Vista is unclear, but with Ave 3D User Pic, you can easily simulate the 3D rotate effect. To start simulating 3D rotating user account picture, unpack the zip archive and run the 3duserpic.exe executable. To quit or exit from the application, double click again on 3duserpic.exe, and a 3DUserPic dialog window will appear which allows users to stop the effect, and then quit the program. Ave 3dUserPic only runs on Windows Vista 32-bits version. There are some downsides to the application, where if you stop the hook manually through the dialog window and then immediately restart it will cause explorer crashes. To avoid this error, always quite the application after stopping. Another annoying downsize is the image no longer changed when hovering mouse on other menu items in Start Menu. Beside, by simply running the application itself may crash explorer too as it injects code into explorer.exe. So use at own risk.